One of the things I am trying to teach Peyton is that the Holidays are not about getting presents. Yes, receiving presents is nice, it’s fun. Parents love seeing our little ones facing light up on Christmas morning but presents are not what Christmas is about. Christmas is about the gift that God gave us, his son Jesus. God gave us a present. And somewhere along the way we turned that into children getting presents from Santa on Christmas morning. 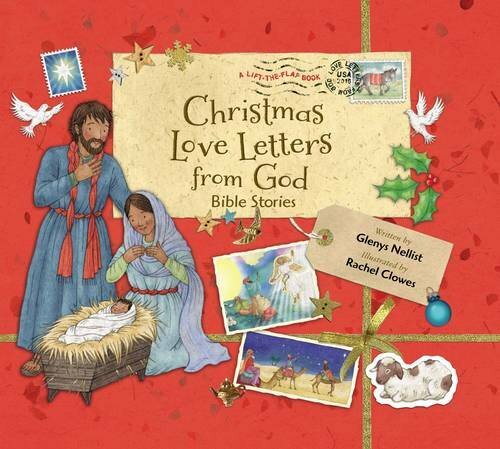 In Christmas Love Letters from God your little one will learn about Jesus’s story through seven different stories told in a form of poetry. The books begins with story of Isaiah sharing his prophecy of Jesus’s coming. And the last story is about the wise men arriving at the manager. At the end of each story there is a little letter folded up and inserted into an envelope attached to the page. Your child can take the letter out and read it. It’s from God! There is even a little space at the top of each letter where you can add your child’s name. So you can personalize it to your family. When Peyton saw the first letter she was pretty excited. And then when saw that her name was on the letter she grew even more excited! As we read the letter together Peyton put together that the letter was from God. Oh boy, that made her happy. She thought it was so neat getting her own letter from him. Each letter contains a special Bible verse, entitled God’s Perfect Promise, as well as God’s personal words of love, promise, and hope. This really is a cute book perfect for preschoolers to second graders, maybe a little older. It is about 32 pages and full of illustrations. We started out with me reading it to Peyton and now we are working on Peyton reading the store to me. It ‘s a great way to spend some time with your little one, get them excited for the holidays, teach them about Jesus’s birth and help them read. You can purchase a copy of Christmas Love Letters from God online or your local bookstore.